This past year our art specialist was cut from our school. Which means this is the first year that I've had to teach art in my classroom by myself. Luckily, I have a super cute room mom (who majored in art in college) who volunteers to come in my room twice a month to lead my students through a fun art project. 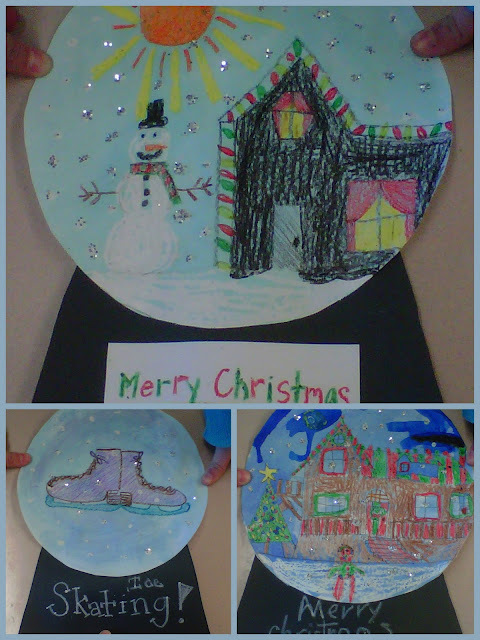 Here are some of the cute snow globes my students made yesterday! -Cups/plates for white paint for each group. Step 1: Using white cardstock, have students use the circle pattern to trace a circle. Step 3: Mix the blue water color paint and water to create a wash. Color the entire circle with the blue wash. Let dry. Cut out circle. Step 3: Use the white tempura paint to create dots over the entire picture. Step 4: Cover in silver and/or white glitter. Step 5: Cut out the snow globe base from black construction paper using the template. Let dry. Step 6: Add a Christmas message to the base using white crayon or a scrap of white paper. Glue base to circle. TADA! A beautiful and fun Christmas art project!